Soybeans, soyoil, soymeal and corn traded lower. Wheat was unchanged to slightly higher. US Dollar was higher. Most commodities were lower. 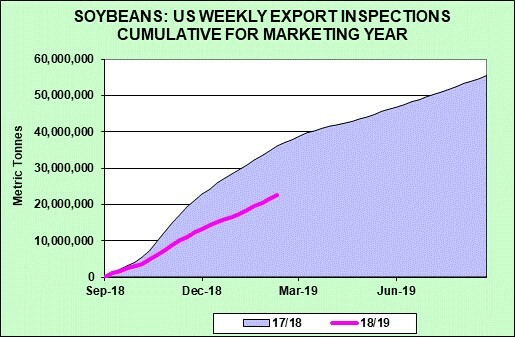 Improving South America weather and concern over the outlook for US and China trade deal and potential for another partial US government partial shutdown is weighing on soybean prices. SK is back below key moving averages. Latest CFTC commit of traders reports showed funds longer soymeal than expected. CONAB will be out tomorrow with their latest Brazil crop estimate. Harvest pace is still ahead of average. Weekly US soybean exports were near 39 mil bu vs 40 last week and 49 last year. Season to date exports are near 831 mil bu vs 1,324 last year. USDA goal is 1,875 vs 2,129 last year. Some feel US farmers could plant less soybean acres in 2019 than last year. Key then will be demand. Main fundamental is outcome for US and China trade deal. Some now hope China may agree to buy more US farm goods in hopes for an extension of talks on the remainder of the deal. Corn futures were mixed to lower. There was some follow through selling following Fridays USDA report. Some feel USDA did not drop US and World carryout as much as hoped. 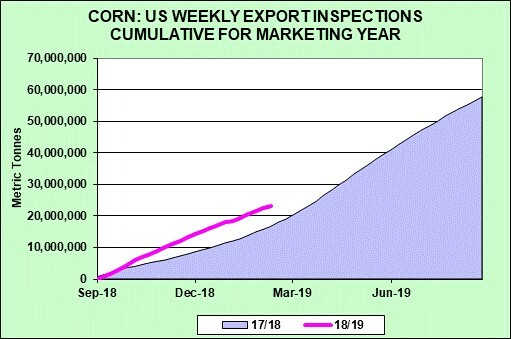 USDA also estimated the 2019 Brazil corn crop near 94.5 mmt versus 82.0 last year. Argentina 2019 corn crop is estimated near 46.0 mmt versus 32.0 last year. Ukraine 2019 corn crop is estimated near 35.5 mmt versus 24.1 last year. Most look for US farmers to plant 91.0-92.0 million corn acres in 2019. This could produce a crop near 14,900 mil bu. If US 2019/20 total demand is near 14,905, then the carryout could remain near 1,765. May corn futures are below key moving averages. Large unsold farmer 2018 supplies and talk of higher World 2019 supplies limits the upside. May futures are expected to remain in a 3.70-4.00 range until more is known about US 2019 supply. Wheat futures closed unchanged after spending most of todays trade lower. 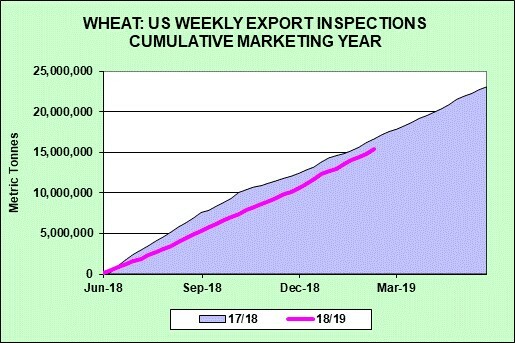 Daily sales of US wheat to Egypt and Nigeria plus good weekly US exports offset the higher US Dollar and talk of higher World 2019 wheat supplies. Fact USDA increased US 2018/19 wheat carryout on Friday may have offered resistance to prices. Weekly US wheat exports were near 20 mil bu vs 16 last week and 18 last year. Season to date exports are near 565 mil bu vs 630 last year. USDA goal is 1,000 vs 901 last year. May Chicago wheat futures are trending back near the lower end of the trading range from November. Talk that Russia may not reduce wheat exports also offered resistance. Early est of US 2019 wheat crop is near 1,975 mil bu vs 1,884 last year. This could add to US final 2019/20 wheat carryout.